After the Bears abysmal 5-11 performance this season, fans hoped for change. They longed for better results, competent coaching and more talented players. So, the hunt was on for a new head coach. Soon after they fired head coach John Fox, the Bears found what they were searching for. They announced in early January the hiring of new head coach, Matt Nagy. Nagy was originally a quarterback himself, playing for the University of Delaware and in the Arena League. During his playing journey, he mastered the offensive side of the ball. This offensive mindset helped set the tone for his future coaching career. His most recent and major coaching position was with the Kansas City Chiefs as an offensive coordinator since 2016. During his tenure with the Chiefs, he led the offense to an impressive fifth place in total yards per game and seventh place in passing yards. Furthermore, Nagy and the rest of the coaching staff led the Chiefs to an outstanding 10-6 record, and a first place finish in the AFC West. This experienced coach, who helped lead Kansas City to two consecutive playoff appearances, was exactly what the 5-11 Chicago Bears were looking for. Many things weren’t working for the Monsters of the Midway this season. Above all were passing yards, which the Bears ranked last in the league for. Averaging only 175 passing yards per game and 112 rushing yards just wasn’t enough to propel this team to victory. Offense was a huge problem for the squad; they couldn’t put points on the board. The Bears ranked an appalling 29th in the league for points per game, averaging 16 and a half per bout. While some point out the Bears offensive woes can’t be totally blamed on rookie quarterback Mitchell Trubisky, the seven interceptions he threw didn’t help either. Alternatively, Nagy could be the key to the Bears’ lacking offense and will motivate the talented roster to greater things this season. 16 head coaches into their legendary franchise, Bears fans are still searching for the coach that can bring the squad out of the dirt. Nagy has brought hope to The Windy City. Supporters are also looking forward to the special roster and believe Nagy has the talent and experience that the Bears have lacked these past few years. They also have high hopes for Trubisky’s development under Nagy’s tutelage. 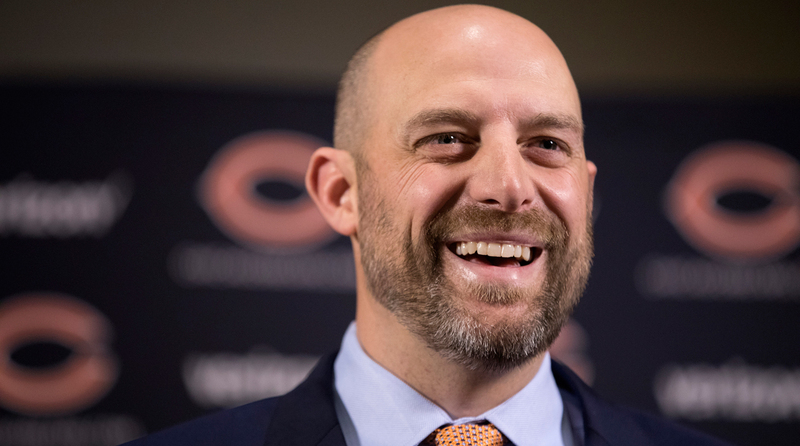 So, can Matt Nagy, first-class coach of the Monsters of the Midway, lead the Bears to a long-awaited Super Bowl win? Only time will tell.